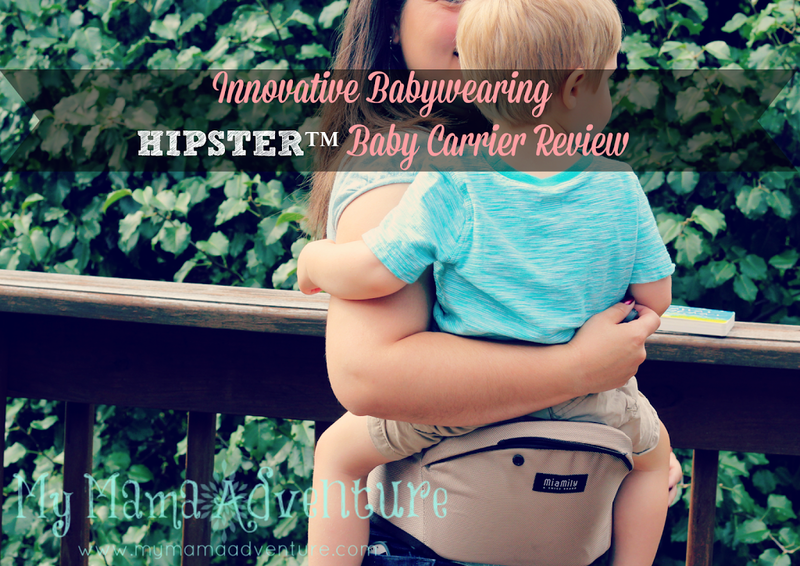 As promised, here is my review of the new and innovative HIPSTER baby carrier by MiaMily. HIPSTER is still on Kickstarter, but the good news is, they’ve been funded!! You can still head over and donate to further support their campaign, in addition, if you pledge $120 or more, you will get your own HIPSTER. If they reach $50,000, each backer will receive a HIPSTER baby onsie, they’re almost at $50,000 so definitely help them out and share, share, share! I received the HIPSTER from MiaMily as compensation for this review. I’ve had a couple weeks to give the HIPSTER a try and I can honestly say, it’s nothing like other carriers we own or have tried. It has an actual seat that baby sits on and supports baby’s hips. This is what gives the HIPSTER its ergonomic design, so don’t let the narrow looking base fool you. M’s hips were fully supported and he was quite comfy while in the carrier. What is truly interesting about the HIPSTER is that the seat of the carrier can be used alone, with a double shoulder attachment, or single shoulder attachment. With these options you can actually use the HIPSTER in 9 different positions! The seat can be worn on your front with baby facing you, facing out, or on your hip. Add the double shoulder attachment and you can wear baby on your front facing you, facing out, or on your back. The single shoulder attachment allows for you to wear your baby on your hip, facing you, or facing out. That’s 9 different ways!! I tried out the HIPSTER in all carry options except the facing out with the single shoulder attachment. While I am not usually a big fan of facing out carries, I can say that in the HIPSTER it felt comfortable and M really seemed to like it, he had a big smile on his face! I did not try it for an extended period of time though. The HIPSTER has a nice safety feature at the zipper area. At the ending point of the zipper, there is a snap to hold the attachment and the seat together. The first time we tried the 2 shoulder attachment with M facing me, the zipper came undone from the starting end – pretty sure I did not have it in the entire way though, as we’ve had no further issues since that first time. I also think that when I was fiddling with the shoulder adjustments, I pulled them too tight, putting too much strain on the zipper. However, I would love to see a 2nd snap on the starting end of the zipper to add extra support in this area. Since that first attempt, we have had no issues and M has been super comfy in both the front carry and back carry of the double shoulder attachment. It was actually much easier to get him on my back with this carrier because of the seat, an added bonus! I also love that the front panel of both the double shoulder and single shoulder attachments zips off to reveal a mesh layer, perfect for warmer weather! I did find that the single shoulder attachment was difficult to adjust when M was in the carrier, it was a minor issue, but I’d love to see the straps have the same adjust feature as the double shoulder attachment. Otherwise, I love that I don’t have to unhook 2 shoulder straps and try to figure out a hip carry. It’s really a nice feature to have the single strap attachment that is perfect for hip carries! The hair toss in the first picture was a happy accident! 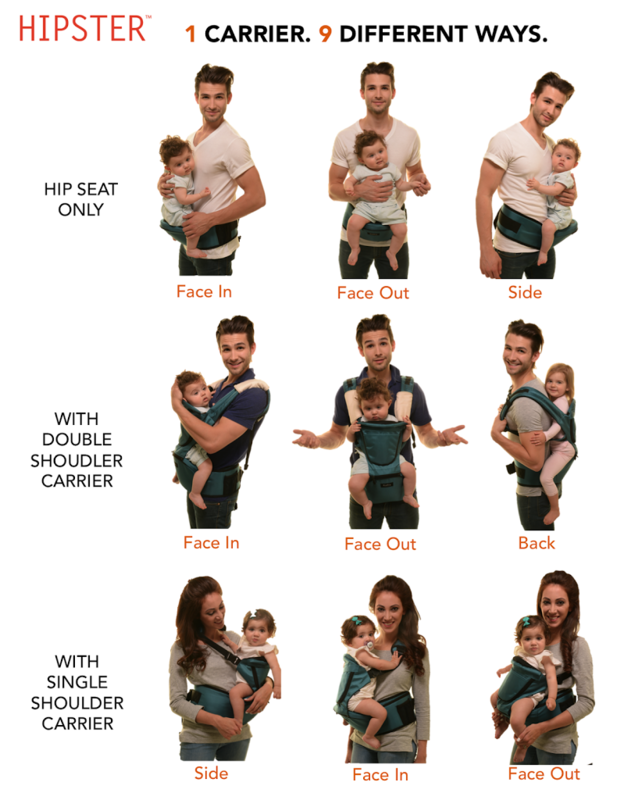 ♦ Versatility – no other carrier, that I know of, has 9 different ways of carrying a baby. ♦ Seasonal – attachments are double layered so the top layer can be unzipped. Underneath is a mesh layer that allows for air to circulate through during warm months. ♦ Ergonomic – despite what it looks like at first glance, this carrier is ergonomic. It appears to have a narrow base that would make baby’s legs dangling, but in fact, the seat that is provided keeps baby’s hips supported to help prevent hip strain. Think of it this way, instead of the fabric creating a seat like other soft structured carriers, the HIPSTER has an actual seat. ♦ Easy to use – it appears overwhelming at first, but really, it is quite simple and works like most other soft structured carriers. Everything easily zippers on (just make sure you have it zippered correctly) and is easy to unzip. ♦ Cell phone pouch – Love that this carrier has a pouch for a cell phone, many carriers do not come with extra pouches so this is a nice feature. There is also a pocket on the outside removable layer when using the top versions of the HIPSTER. ♦ Detachable hood – since M never liked hoods on carriers, I like that I can remove the hood and stow it away. ♦ Wide waist strap – this is nice for added back support and if you’re a mama with a little extra pooch in the tummy, it doesn’t dig and is comfortable. 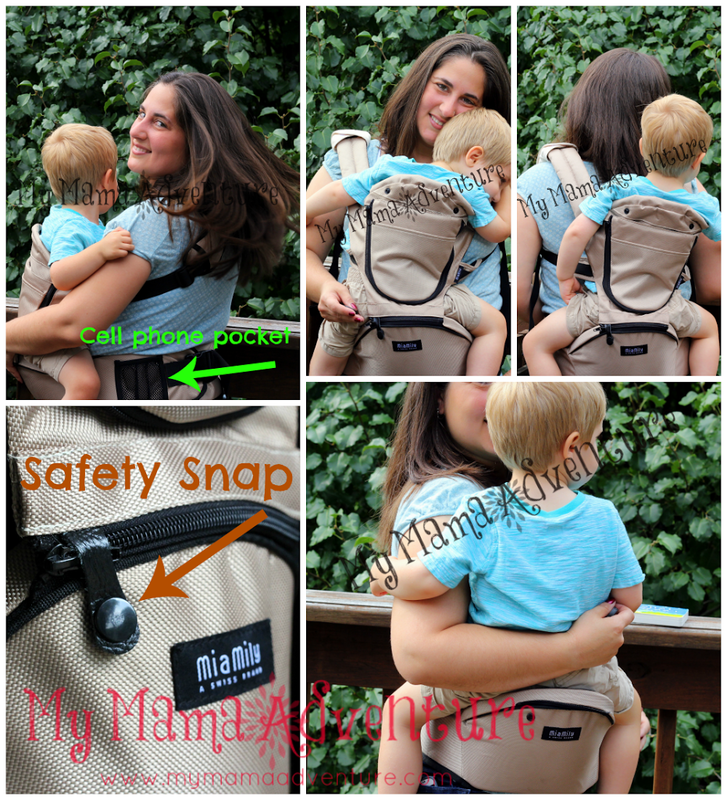 If you’re looking for more information on the HIPSTER, their Kickstarter Campaign, or MiaMily as a company, head over to my previous post: HIPSTER™ Baby Carrier by MiaMily on Kickstarter where you can read more about how they got started and their awesome One for One Charity campaign. 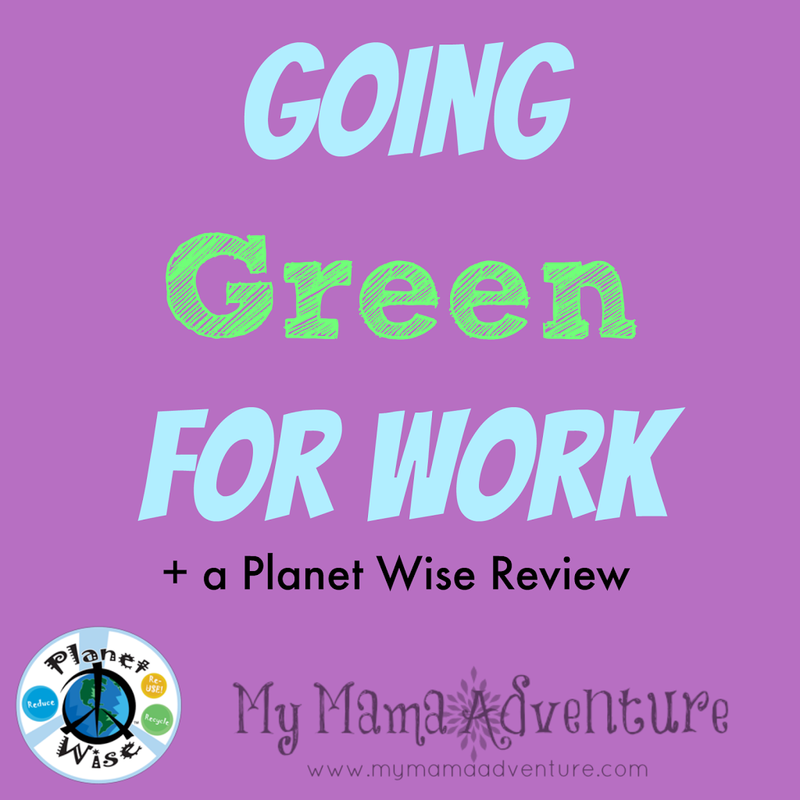 As summertime begins and families head to the beach, the park, the mountains and other favorite spots in the great outdoors, it’s a good time to remember there are easy ways to celebrate our love of Mother Nature by throwing a green party. Pick a picnic spot you can walk, bike or boat to or arrive by public transit. If that’s not possible, carpool with friends. Whether throwing a baby shower, a beach party, birthday picnic or backyard BBQ, you have to let your guests know about the green fun you’re planning in eco-friendly style! If it’s a neighborhood party, print invites on recycled paper and personally hand them to guests. Or use electronic invitations, which are convenient and don’t waste paper. Great produce makes the chef’s job super easy. Think simple. Finger foods like cut fruit, nuts, local honey and peanut butter sandwiches are simple and nourishing for all ages. Also, some cheeses, like brie and Camembert, are lovely softened in the sun over fresh-baked bread. Farmer’s markets have the freshest and tastiest fruits and vegetables available from the area. Organic products are hormone and pesticide-free, making them safe to eat. Make your own beverage and serve it in a plastic-free pitcher. That way you don’t have to deal with all the cans and bottles. Say goodbye to throw-aways and plastics. Ask picnickers to B-Y-O dishes, water bottles, utensils, etc. This can be done tastefully if you explain you’re hosting a zero-waste party and need some help to accomplish this. If that’s not your style, pack a sturdy cardboard box with reusable items to share with your invitees, such as non-breakable stainless steel picnic plates, reusable bamboo utensils, reusable straws, washable cotton napkins and sturdy mason jars for use as cups. Sure, you may have to do some washing, but much of this stuff will naturally decompose. Plus, you’re saving money by going waste free. Nature’s beauty is inspiring when it comes to setting the table eco-style. Leaves, flowers, pine cones, twigs, seashells and other natural treasures can be showcased at your eco-friendly BBQ or green beach party. Clearly mark bins for recycling, compost and waste for your guests. Since most public parks don’t separate waste and your efforts will end up in the trash, toss your separated bags into the trunk to put out with your trash pickup at home. How will you green your summer events? Calling all seasonal allergy sufferers! I’m here to tell you, you are not alone in this struggle. Honestly, I thought giving birth to M had cured me of my seasonal allergies. Seriously, up until his birth, I was taking a daily antihistamine to help with allergies. Then, once he was born, it was like a miracle beyond his birth had happened. My seasonal allergies (and other allergies) were all but gone, minor, rare issues would sprout up, but never did I feel the need for an antihistamine. This summer has broken all the rules since M’s birth. Itchy, watery eyes, sneezing – Oh! The sneezing! – Non-stop runny nose, and when it does stop, congestion, straight up inability to breath. Headaches, sinus pressure. It feels never ending and when one of those severe allergy attacks hit, I’m down for the count! Yes, I’ve popped an antihistamine twice this summer. It felt necessary, but you know what? The antihistamine didn’t help. No, really, it didn’t. Those two times, I ended up taking a sinus medication, which at least stopped the runny nose, itchy eyes, and sneezing – the congestion, there was no relief but holing myself up in my house and waiting for the attack to pass. 24+ hours of discomfort and feeling miserable, both times. This summer has been awful, never have I had allergies like this year. I hate to continue popping a pill. I’m not one to take medication unless absolutely necessary, if I can find a more natural way to relieve my symptoms, then I’m all for it. So, when Discover Natural Solutions sent me a dōTERRA Essential Oils starter kit with Lemon, Peppermint, and Lavender, plus samples of On Guard and Past Tense, I jumped right in to find relief. 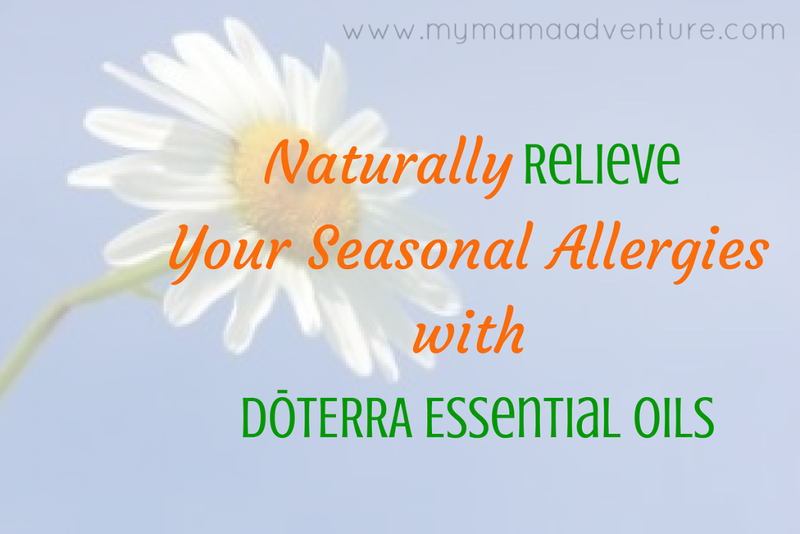 It has been so incredibly easy to use dōTERRA Essential Oils as a way to keep allergies at bay. The Lemon Essential Oil is great for putting into water or tea, one drop is all you need, for an extra boost, add some local honey. This combination makes a huge difference in my daily seasonal allergies. The Peppermint Essential Oil has been great for perking me up when my allergies drag me down during the day. Simply smelling it seems to boost my senses and wake up my allergy clogged brain. The Lavender + the Past Tense on my temples and the back of neck/shoulders area has seriously blown me away. Discover Natural Solutions recommended the Past Tense on my temples and neck to relieve headaches. I carried it around with me one day at work, dust was flying everywhere as we packed to move into a new office. My head obviously began throbbing. I tried the Past Tense, skeptical. You could even ask a co-worker, the words “come on dōTERRA, do your thing” as I impatiently waited for headache relieve. I remained skeptical until about 20 minutes later, I realized my headache was gone. Nope, still didn’t believe it could be that simple. I continued to carry the Past Tense around with me. Next headache came along, I did the temples and neck/shoulders area again, within 20 minutes my headache was gone. I’ve asked Hubs to give it a try to see if I’m experiencing some sort of placebo effect, unfortunately, he hasn’t had a headache (lucky!). I haven’t taken a pain reliever for a headache since the dōTERRA Essential Oils arrived in my mailbox. The Lemon Essential Oils and local honey mixture – yes, this is daily! I sometimes skip the honey, but the Lemon is everyday in my water bottle. If I skip a day, I notice a difference, more sneezing, more congestion. I won’t go so far as to say that it completely gets rid of my symptoms, but it definitely seems to lessen my symptoms to a tolerable state. I seem to have pretty severe symptoms this year though, I would bet that the allergies I’ve had in past years (even before M’s birth) would have been nearly resolved with dōTERRA Essential Oils. I have not had a chance to try the On Guard. Why? It’s primarily used to help fight off illness, especially at the first signs of illness. I have not had any issues with feeling ill (cold, fever, sore throat, etc.). I have no doubt that it would be effective though as I’ve heard many friends swear by On Guard and I’ve tried similar products in the past with great success. I suppose I could start using it to ward off any potential illnesses, but I have no idea how I would report success with this, would I be healthy because of the On Guard, or because I wasn’t going to get sick in the first place? My illnesses usually come in early to mid fall, I’ll be breaking it out sometime in October, at which point, I’ll let you all know how it works! Though, again, I’m pretty sure it will be very effective at fighting off my usual Autumn flu symptoms. For now, I’m just thrilled to have some seasonal allergy relief. I’m even more thrilled to know that I’m using something that is natural and safe. To learn more about dōTERRA Essential Oils and how they are extracted, distilled, and processed, visit the Discover Natural Solutions site, they have tons of information on Essential Oils, how they work, and how to use them. Ready to give dōTERRA Essential Oils a try? Welcome to the June 2014 Natural Living Blog Carnival: Eco-Friendly Summer. This post was written for inclusion in the monthly Natural Living Blog Carnival hosted by Happy Mothering and Crunchy Farm Baby through the Green Moms Network. This month, our members are talking about how they are keeping their family eco-friendly during this summer season. Stop by all of the posts listed at the bottom of mine to get ideas on how your family can keep it safe and natural this summer. 1. Non-toxic sunscreen – we started looking into more natural sunscreen alternatives last summer when I started reading about traditional sunscreens and how many of them have toxins that can actually be harmful to our bodies. I’ve also found it really interesting to read that while sunscreen use has gone up over the years, skin cancer is also on the rise. I’m not a scientist, I’m not a cancer researcher, but I still find this to be a very interesting correlation. So, rather than risk our exposure to these toxins, we went on the hunt for sunscreens that contain natural ingredients but are still effective at protecting our skin, especially M’s skin. We have been very happy with BabyGanics and California Baby sunscreens. Depending on the BabyGanics formula you get, you’ll have an EWG rating between 1 and 3, what we have used is rated a 2. California Baby sunscreen ranges between a 1 and 2, our current bottle is rated as a 1 on EWG. We do spend more money on the natural brands but it is worth it to me if it protects our skin and keeps our bodies free of unnecessary toxins. 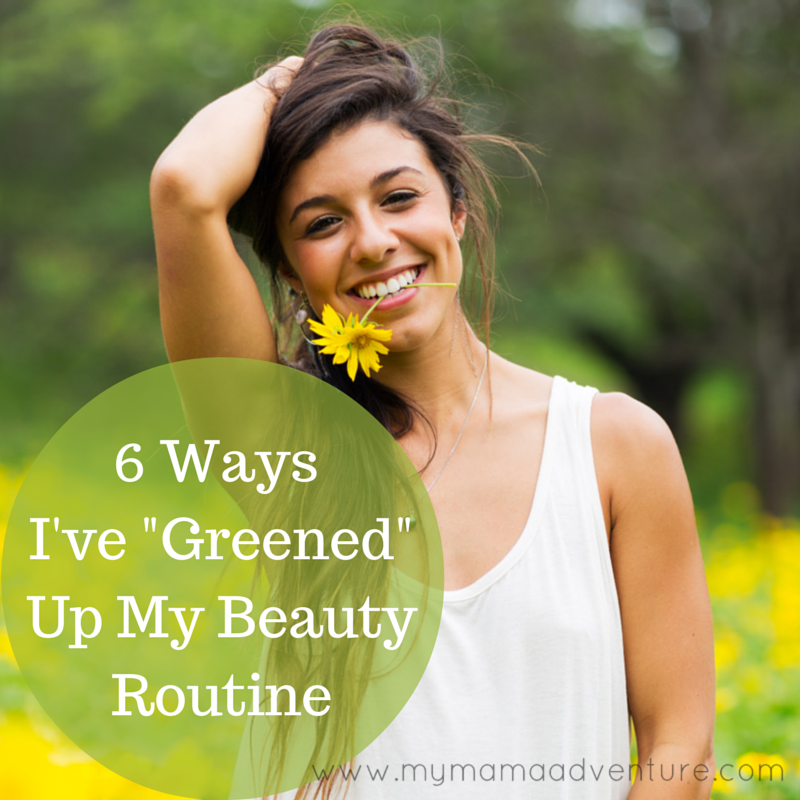 Plus, I’m allergic to traditional sunscreens (I’ve tried them all – rash everytime) and I’ve never had a reaction to the natural brands we’ve tried. Ingredients to Avoid: anything that ends in ZONE (e.g., Oxybenzone). Instead Look For: Mineral sunscreens that are made with Titanium Dioxide and Zinc Oxide. 2. 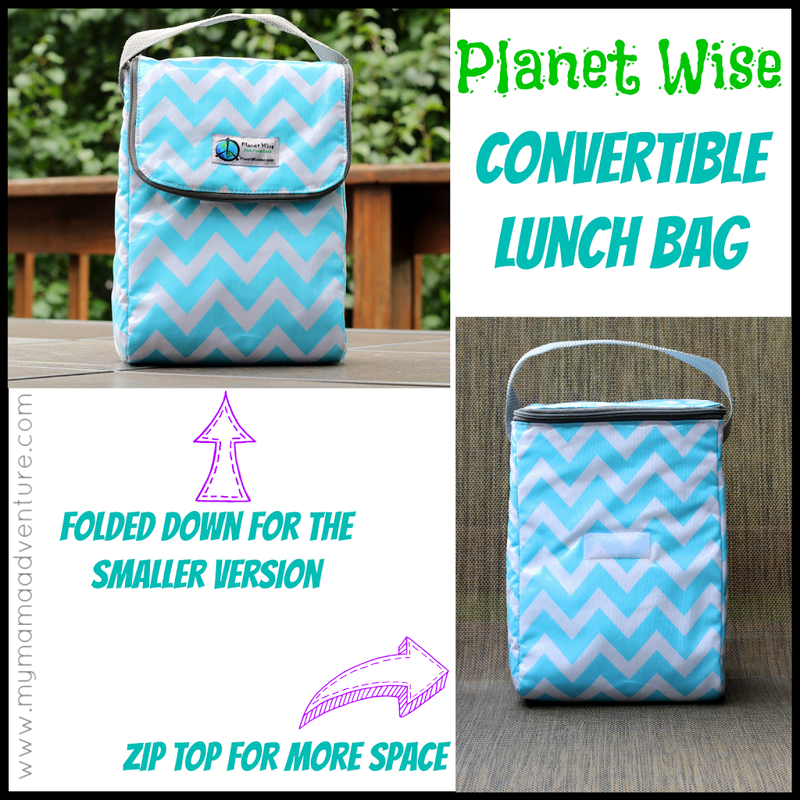 Reusable snack containers – I’ve been a stickler this year for using reusable snack containers rather than plastic baggies. We have a couple reusable bags, but they have been lost. I plan to make more because they really do come in handy. I frequently use these Zoli snack containers that we received in a Citrus Lane (referral link) box last year. I love that they stack and I can take 3 different snacks but are still easy to fit in a bag for our outings, I don’t have to go searching in our bag for the snack M wants, I just pull the whole thing out and he can choose as he eats. We’ve slowly been transitioning into more glass, but we still have many plastic items. We just make sure that the plastics are BPA, Phthalate free and we don’t microwave our plastic products. 3. Spending Time Outdoors – M loves to be outside! He would spend all day everyday out side if we let him, and he does spend a good chunk of his time outdoors. It’s good for all of us! When we’re outside we’re getting Vitamin D (I’m diagnosed Vitamin D deficient) from the sun, exercise, and the TV is off, computers are put away, phones are not being use (usually), and we are enjoying nature. We go for walks, bike rides (we have a bike trailer and helmet for M), trips to the park, water play, all sorts of fun outdoor activities. We’ve even been able to reduce our time in the car by using our bikes when we can for certain outings. 4. Natural Light – Unless there is a massive storm that turns day into night, our lights are off until close to 8:30pm. There’s no reason to have them on, we have plenty of natural light coming into our windows that we can use instead of artificial light that costs us money and isn’t as eco friendly. Same goes for opening the windows when the weather is mild; the air conditioner gets turned off and windows/doors opened. It’s so refreshing! 5. Organic Produce – What I wish this said was “Farmer’s Market Produce” because then we’d be supporting local farms as well, but I rarely have time to make it to our Farmer’s Markets around here so we make due with buying organic when it’s available. I’ve been paying more attention to the Dirty Dozen (here’s a list of 48 fruits and veggies with pesticide residue, the top 12 are the Dirty Dozen) and been focusing on making sure that we buy organic, for at the bare minimum, produce that is on the Dirty Dozen list. My ultimate goal was to start potted gardens with some of our own produce, but that just did not happen this summer. I do think I will look into blueberry bushes next year though since we go through blueberries more than anything else. 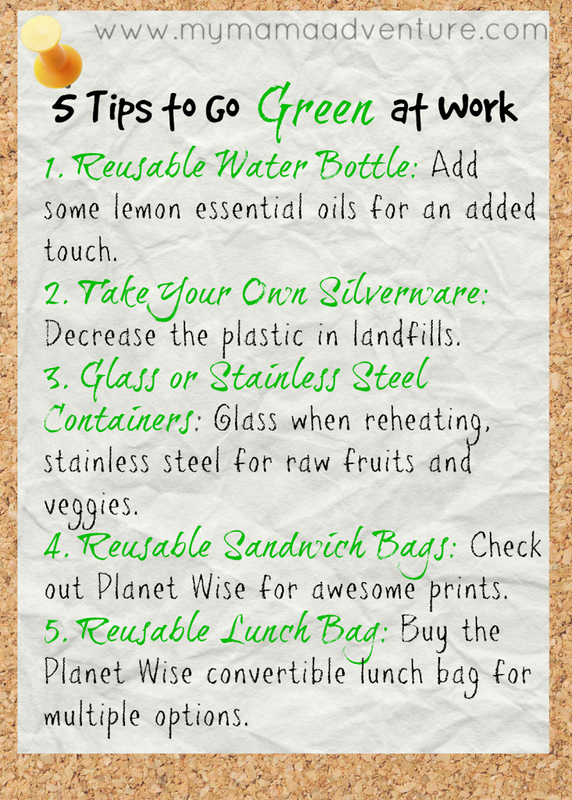 There are many other eco-friendly changes that I would like to do during the summer but it’s little by little. Starting a garden is at the top of my list for next summer. I also should probably start using our clothes line more as well. I am not a fan of line dried clothes so this is a huge reason why I don’t use the clothes line more. It is more energy efficient though and could save us a ton of money. I know for us, the older we get, the more eco-friendly we become, if for no other reason that it usually saves us money! What are your eco-friendly plans for this summer? Over a year ago (we’re talking last January, 2013) I was cleaning M’s highchair tray and realized we were out of dish soap. 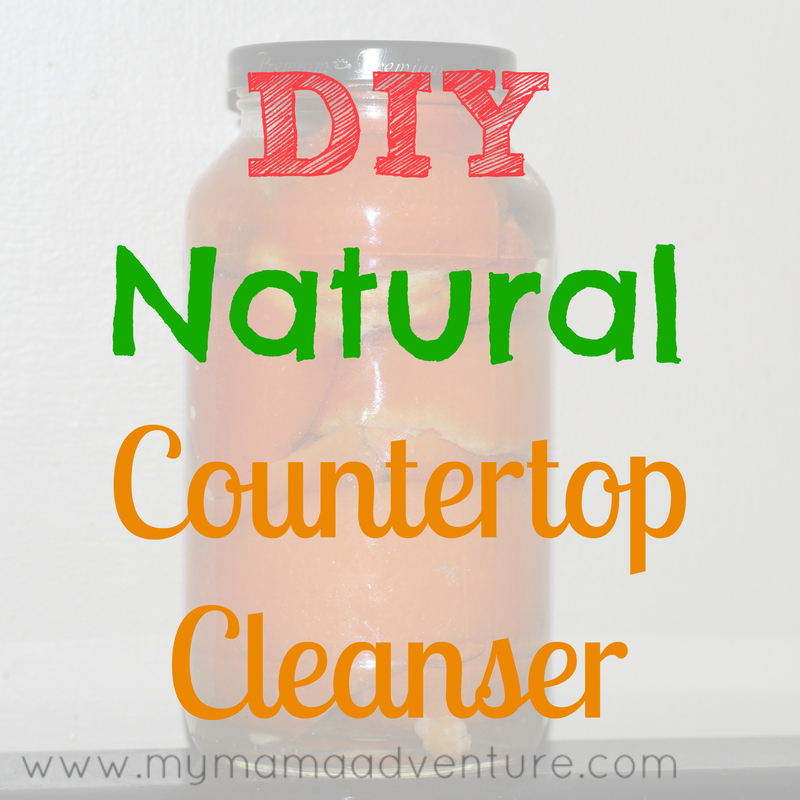 I reached under the sink and grabbed my countertop spray to use instead. I mean, I use it on our counters, it should be fine for his highchair tray, right? Maybe, but after I used it, I had this nagging feeling. I considered the ingredients of the spray and realized, if I wouldn’t want him ingesting the spray, why would I feel okay with him eating off his tray that was just cleaned with said spray? I decided I wasn’t okay with this idea.